Moose Creek Reservoir is a great place for a little peace and quiet. Nice bass fishing for a smaller reservoir. Campsites are well cared for. Beautiful location and a lot of scenery. We stayed only one night, around the 4th of July. It was very busy with lots of kids and little privacy. We had lots of fun with the river right there and watersports. Bathrooms and showers are available for a fee. Busy campground and park for fun. Beautiful scenery, no reservations, quick quiet hikes. There are bathroom facilities. Beautiful views, hikes are about 1-3 miles. Beautiful overviews of the falls and if you’re adventurous and fit enough can climb down the canyon to the base of the falls and walk along the river. Lots of wildlife, watch out for rattle snakes. Stick around for sunset you won’t be disappointed. Camping is in an open grassy area, no reservations or real boundaries between sites, all sites are smushed together. Very transient turnover. Most people stay one night. A discover pass is required. Our stay here was very satisfying. Plenty of hiking to do. Plenty of places to stay. If you are into biking, it is located at the beginning of the Trail of the Coeur d'alenes, a 72 mile paved trail. The Chatcolet campground is only feet from the side of the trail. Make sure to make reservations ahead of time and leave plenty of time to explore. We have stayed at Chief Thimothy quite a few times. It doesn’t seem as well kept as other parks we like! The grass is blotchy, so if there’s rain, there’s mud…no rain,lots of dust and dirt! Easy access to the river with little docks along the shore. Swimming area available,too! Bathrooms, laundry, and full hookups all available. Dog friendly! I wish we had more time to spend at this campground. It was a bit off the beaten path but worth it. It is also situated right by a lake, but did not see any direct access to the lake from the campground. There were clean restrooms here and showers. There is also a visitor center to purchase items but they were closed by the time we rolled in. They were open in the morning, roughly around 8. Would like to go back and stay a couple of nights in the future. There was a no burn order in place, or site was nice and secluded. The camp is first come first serve. There’s only 12 spots for tents and there can be up to 8 people per spot. The views are amazing and the sunrise is amazing from camping area. We were there in late August and it was pretty cold at nights but the days were cool enough to go for a hike. Even in early June it was sweltering and dry at Palouse Falls. We stumbled upon the park while driving across the country and it was a welcome break from the monotony of the region. As soon as the sun started going down the weather cooled off enough to walk around the rim of the canyon above the river and waterfall. We didn't try swimming but I hear that there are a few places that it's safe to cool off in the water. Our favorite campground🏕, We visit every year.! The Trail of the Coeur D'Alene runs through this campground.Biking 🚵‍♀️the 7 mile ride to Harrison is a great way to spend the day, you cross the lake over a bridge, watching eagles 🦅 swoop over the lake as you ride, and finish your day with ice cream 🍧 at Harrison Creamery and Fudge Factory! You can also kayak🛶, boat⛵, hike 🏃and fish🐟. The perfect campground to keep the whole family entertained! We went for a family reunion. We had a good time. It was very crowded. If you dont mind campsites that are open and no tree blocking and your neighbors are right next to you. However we did have access to water from our campsite. That is always a bonus. The sites are inexpensive. Running water and pit toilets on site. Very nice playground in the day use area. Only reason for 4 stars is not being able to reserve a spot. Very quiet, cozy location. Stayed here twice; both times was an overnight stay while waiting to pick my Scouts up from summer camp. The sites are very spacious and vault restrooms are located all through the grounds. I’ve never made it to swim; however, the area is quite large. We used to frequent this park quite often. It is a tiny forest tucked away along the river…. when I say tiny, I mean fairy like. You can easily set up a tent and float along the river's edge. There are a few little coves that are nice for kids to play in and great to stay out of the river current. Just a fun location! Chief Timothy is a great campground not far from clarkston that provides all he ammenties any camper would want. They have rv and tent sites available. Great atmosphere very well kept grounds makes this a great place to take your family! Pull thru sites for rvs makes it easy to come and go as you please. They have a designated swimming area and a boat launch if you have a boat. My family always loves camping here. We pulled in here a few nights ago and are LOVING it!!! This place is very clean, well maintained, the office gals are so friendly and full of information. The banquet room, game room, pool, laundry and bathrooms are clean and beautiful. It is close to town but on the outskirts away from the hustle and bustle. It is nestled near the marina and has gorgeous views of the river! Definitely a top notch park in our books! We pulled in late over Fourth of July weekend they allowed us to stay for a week the office assistants were the sweetest people ever. Great park, with great helpful neighbors. The manager does NOT allow kids although this is not advertised or posted anywhere! We were lucky to have only made contact with the assistants which were great but the manager not so much!! She even left a sticky note on our ticket that said, “Do not allow kids to stay any longer!” For having two older children who mind there own business and are very well behaved we were put off a bit by this. We pulled our 40ft RV up here and had a great time! Not full hookups but lots of fishing we caught: blue gill, trout, bass, crappie, perch, cat fish and had a small Tiger Muskie on the line but lost it. We were there for two weeks and they did have electricity and water hookups just no dump so we showered and used the bathroom facilities which were very well kept! So we didn’t mind. There is a dump station just in town at the gas station there. Overall great experience and nice to be off the grid for a bit! Very dry with little tree coverage. Loads of people and every campsite was full. Lakes are great for fishing with kiddos. Cannot ride dirtbikes or 4 wheelers in the campsite or on the road unless street legal. If you go up higher towards the horse corrals it isn't as dry and tends to be less crowded. I absolutely adore this park! camping and hiking in the summer, tubing in the winter, mushrooming in the spring. There is no time of year that is bad for this park. Stayed in the tent sites in Chatcolet, we got lucky and were in a site that was a bit more level. Noticed a lot of sites are unlevel. I also thought we were going to be closer to the water but its like a 5 min walk or you can drive/bike down to the playground, boat docs, water. Not sure if I'd go back or find a different place to go. 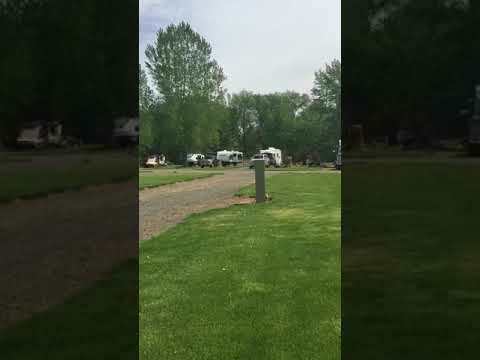 This is an all paved rv campground on the Snake River and bordering Lewiston, ID. It has all the amenities of the Premier RV Resort affiliation. It has all the hook-ups and all sites are well manicured. A lot of the sites have longer term rv's from seasonal workers and such, it is not like a long term trailer park though. The management works to make sure your needs are taken care of. There is a paved walking trail alongside the park that follows the river with pet statiions located at intervals and is maitained by the municipality. There are Snake river boat tours nearby and plenty of shopping close and throughout the community. Fishing is a big activity on the rivers. Free dry camping on the Snake River near Little Goose Dam. No reservations. First come basis. Boat launch. Beautifully maintained campground with friendly camp hosts. Affordable, large pull through sites. Large shade trees in several sites. Some of the most level sites we’ve stayed in. Community fire pit or bring your own to have in your site. Nice bathrooms with showers ($1 in quarters for 7 minutes). Plenty of grass area for kids to play in. Pets welcome. Close to Tucannon and Snake Rivers. Open year round. My husband and I love this State Park. It was definitely a good, long drive to get to, but was so worth it (about 5 or so hours from Walla Walla). The campsite was close to showers and water, and not too close to others. Both tent and RV camping is allowed. The hiking trail was long and absolutely amazing, and we ended up near a fire cabin used during the winter and summer. There was a night where coyotes came very close to the campground, and the rangers took care to ensure they didn't get too close. Everyone we came into contact with was friendly and helpful. We saw so much wildlife since it's located far away from cities and people. So worth it!